The EC Model dehumidifier is the result of our 30+ years of research, development, and experience in the US market. 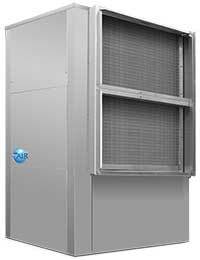 These units contain the most flexible air humidity control technology available today. They are designed for reliability while reducing installation costs, and, providing the comfort and cost savings you’d expect from DXair. These pool dehumidifiers provide the best combination of performance and efficiency available. Safety devices are built into each unit to provide the maximum system protection possible. The EC Model features (as standard) G-60 galvanized steel cabinet and stainless steel drain pan to ensure long life. To help prevent formicary corrosion, evaporator coils with DuoGuard™ coil protection can be applied as an option. Rigorous factory testing helps to ensure fewer hassles from the start while our decades of experience in designing pool dehumidifiers is your assurance of the highest quality product. Our EC Series units with Bronze Glow technology have successfully passed the 10,000 hour salt spray test! Most companies do not achieve 10,000 hours on this test. With this option we Bronze Glow coat the evaporator and hot gas reheat coils, the interior blower cabinetry, and outer unit—greatly increasing the unit’s resistance to the hostile conditions of an indoor pool environment and/or salt air. The information contained in this website is the property of DXair and may not be copied, used, or disseminated in any format without the prior written consent of DXair. DXair does not share your contact information with any outside sources other than those directed to you for mechanical contracting or for the purposes of bidding the installation for you.